Announcing that I am teaching art lessons on Saturdays this fall! I will continue to teach Mon-Fri between 11:00am-7:00pm and then Saturdays until 3:00pm. Thoroughly enjoyed painting this commission piece! 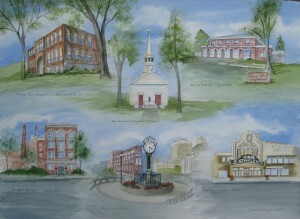 I think my client had an excellent idea of creating a painting of sites from her hometown that played important roles in her family’s history. 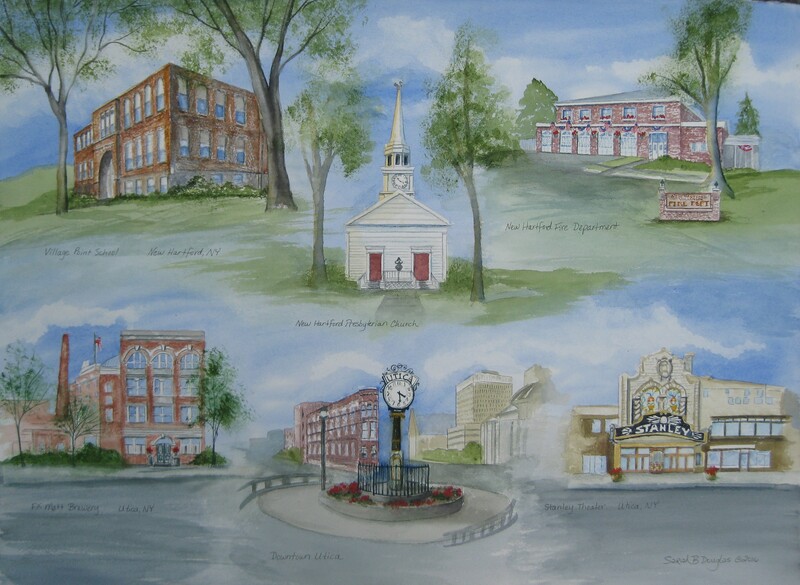 This 22×30 inch watercolor took a couple months to complete, especially as I used very small brushes for detail work. It was fun to watch the progress as I finished each building. Art Lessons For All Ages runs year-round! Summertime one-hour lesson spots are available during the daytime and into the evenings. Great time to develop drawing and painting skills and techniques! My Art Lessons For All Ages was listed in today’s paper – the News and Observer-in an article about painting classes in the area! One of the many benefits of teaching individual art lessons is that I can give my students flexibility in scheduling! I teach lessons throughout the day and into the evening. For some students this means they can schedule their lessons from week to week on the days best suited for them. Other students prefer to have set schedules with “their time and day”. Either way, flexibility is key! 11 years of teaching lessons! 2016 means I’m entering into 11 years of teaching individual art lessons! I am just as excited to be doing this as when I first began. It is wonderful to be able to teach art skills and techniques, one step at a time, and watch my student’s art work develop beyond what they imagined it could be. Summer is a great time to learn and practice new drawing and painting skills! Since I teach year round, with flexible time slots, finding time to pursue your art is easy.